Insat-1 was a multi-purpose satellite system to provide two high power TV broadcast and twelve telecommunications national coverage transponders, in addition to also providing meteorological services. The Insat-1A was launched by a Delta in April 1982 but was abandoned in September 1983 when its attitude control propellant was exhausted. When Insat-1B was launched on 30 August 1983, it almost suffered the same fate as the Insat-1A. It was not until mid-September that Ford and Indian controllers succeeded in deploying its solar array. By then it had been stationed at 74°E in place of Insat-1A. Full operational capability was achieved in October 1983. It continued to operate into 1990 with all its 4375 two-way voice or equivalent circuits in use. Around 36,000 earth images were returned. Eleven of its 12 C-band transponder and its two S-band transponders provided direct nationwide TV & communications to thousands of remote villages, plus a detailed weather and disaster-warning service. Around 35,000 Indian built 3 to 3.6 meter diameter, earth receive only terminals were in place to supply rural communities with social and educational programs. It was relegated to spare status on 17 July 1990 by the Insat-1D. 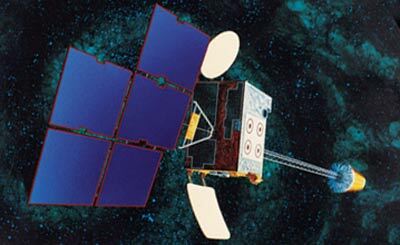 The Insat-1B was finally removed from GEO in August 1993, after being replaced at 93.5°E by Insat-2B. Total cost of Insat-1B and its backup Insat-1C, including the PAM-D launch was estimated at $140 million. The Insat-1C satellite was launched on 21 July 1988 from Kourou for location at 93.5°E to bring the Insat system up to full capacity. Half of the 12 C-band transponders and its two S-band transponders were lost when a power system failure knocked out one of the two buses, but the meteorological earth images and its data collection systems were both fully operational. Earth lock was lost 22 November 1989 and the satellite was abandoned. Reported insurance payout was $70 million. The specification for the Insat-1D is the same as the Insat-1B but with expanded battery and propellant capacities. Launched on 12 June 1990 to conclude the first generation Insat series. Launch was planned for 29 June 1989 but 10 days before it was seriously damaged during launch preparation, when a crane hook fell on it. The fully insured satellite was repaired by Ford Aerospace at a reported cost of $10 million. It also suffered $150,000 of damage during the October 1989 Californian Earthquake. It assumed prime role from Insat-1B on 17 July 1990. Design life was seven years.